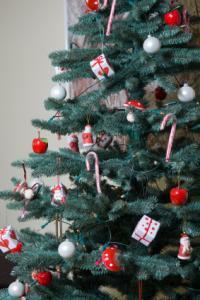 When candy canes hit the store shelves, it's a sure sign that Christmas is just around the corner. Before you hand out these treats this year, attach a poem that will put an extra smile on the faces of everyone who receives them. Enclose one of these poems in a Christmas card along with a small candy cane. You could also add a poem to homemade gift tags and attach canes to them, or include one in favors for your holiday party. 'Cause they taste like Christmas cheer. That's not what Mommy taught. Because Santa would surely see. He won't bring gifts for me. Oh, what a very pretty sight. As sweet as peppermint delight. 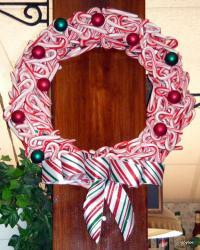 The candy cane wreath is a fun holiday tradition for some families. 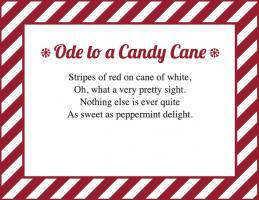 Print one of these poems on cardstock and hang it in the center of the wreath so people know they are welcome to help themselves to a cane. The entire Christmas season through. Before you ring the bell. And take some for your friends as well. They can always find it here. To the bare spots on my wreath. Because the season is all too brief. Could last all through the year. We'll never lose our holiday cheer. See this wreath upon my door? Take a cane, and I'll add more. To give you Christmas spirit too. Attach one of these poems to small bags of candy canes to pass out as treats at a Bible study, Sunday school class, or after church. You can also include one in a gift for a pastor or other staff at your church. 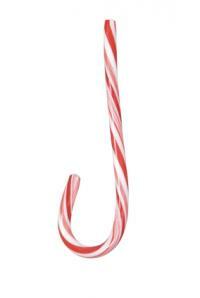 All symbolized in the candy cane that you hold there. And it becomes a J. The true reason for Christmas day. 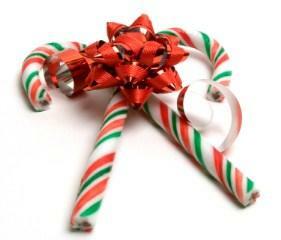 The candy cane is such a simple confection, but it's inextricably bound up with the Christmas celebration. Make your own holiday traditions a little richer by including a poem with each cane you give to the people you love.